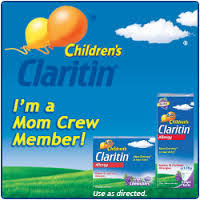 One of my great privlidges as a blogger is to be a part of the Mom Crew for Children's Claritin. I don't know if you are aware, but my Nathan suffered from terrible allergies. One of the things we found that has really helped him is Children's Claritin. He is now at a point in his life where he needs it occasionally, but for a while, Claritin was part of our daily routine. Please don't take any of my experience as medical advice. See the counsel of our doctor and make sure that if you choose Children's Claritin that it is right for you and your child. I got to host a "Spring in Your Step" Mom Meet Up where some friends and I (and our children) got together for some fun and relaxation. It was a beautiful day so the kids were able to go play in our backyard while the moms enjoyed some pampering and learned about Children's Claritin. Everyone received a chart with a Preparedness Checklist and Tips. We also got to have a hot/cold mask. You can freeze it or heat it and use as an eye mask to help with any sinus pressure or pain. We've been using it frozen for more than just sinus. It makes a great hot or cold compress for all minor injuries my children seem to get. Rebekah loves the ice pack and was the first (and only) volunteer who WANTED a picture wearing it. I received samples of both the liquid and the tablet Children's Claritin. We talked about the benefits and who has tried it in the past. Then we put cameras away and had a relaxing mom spa time. We were able to do a Milk Foot Soak (I got GIANT pails at the dollar store that our feet would fit into) and a Yogurt and Honey Mask. No photos of masks allowed. But we had a great time and enjoyed some healthy snacks. We discussed many ways to help keep allergy symptoms at a minimum during allergy season. Would you like to try the Milk Foot Soak or Yogurt and Honey Mask? Here's the recipes. Milk Foot Soak: Add 4 cups warmed whole milk, 2 Tbsp. of Epsom Salt and 6 drops of your favorite essential oil such as lemon, sandalwood or lavender to warm footbath. Soak for 20 minutes. Use favorite moisturizer on your feet. Yogurt and Honey Mask: Mix 1 part yogurt and 1 part honey and apply to clean, moist face. Let it set for 10-15 minutes and rinse well with warm water. The mixture moisturizes, hydrates and soothes the skin. Now for a giveaway. 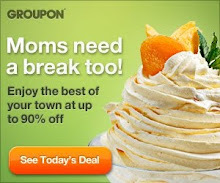 I'm going to send a Moms Preparedness Checklist & Tips chart and a Hot/Cold Face mask to one lucky reader. Use the rafflecopter form below to enter. Disclosure: I received the products at no charge in exchange for a meet up and blog post. All opinions are my own. My tip for allergies,always remember to take your meds in the morning.Keep eye drops and sunscreen in your purse. For allergies, try your best to avoid triggers. Happy Birthday to My True Love! Wordless Wednesday - Happy Anniversary, Sean!